Your application resume is usually the first opportunity admissions readers have to get to know you, your experience, and your skills. 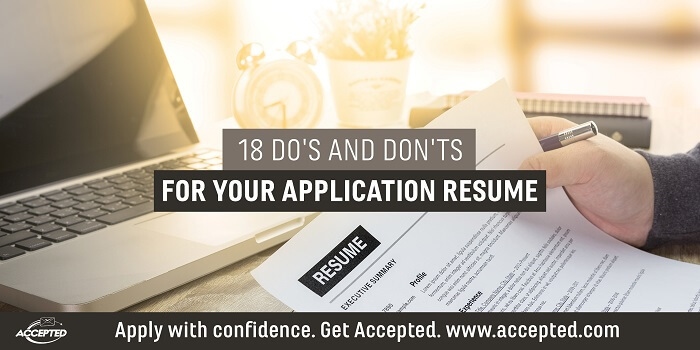 Because of the number of other application components they need to review (both yours and those belonging to the thousands of other applicants), most adcom readers will only give your resume a quick 15-second glance before moving on to the next thing on their checklist. Not only do you have to make a great first impression – you have to do it fast! Fortunately, there are many ways to craft an application resume that strategically highlights your skills and makes you and your qualifications stand out from the crowd. The following do’s and don’ts will help you develop a dynamic, powerful resume that will enable you to sail through the adcom’s initial 15-second screening process and earn your outstanding qualifications the closer look they deserve. Place your strongest material in the 2-inch visual space that begins about 2 5/8 inches from the top of your resume. Make sure you include your most impressive, impactful achievements and qualifications in this “primetime” space. It’s where the reader’s eyes will focus first. Use a professional profile or qualifications section in your resume’s primetime space. This will give the adcom readers a quick but concrete capsule of your achievements and skills. Write this section when the rest of your resume is complete and you’ve already decided what your strongest qualifications are. Give the most weight to your most recent professional position. The section of the resume for your most recent position should contain more bulleted accomplishments than your previous positions. For each position, rank the accomplishments in order of decreasing relevance to the employer you are targeting. Quantify your impact on the organizations you have worked for. If you reduced expenses, say by how much or by what percentage. If you supervised a project, say how many were on your team. Always ask yourself how you helped the organization, and insert the numbers that demonstrate that impact. Pay as much attention to your resume’s design as you do to its content. Include publications, patents, presentations, honors, relevant volunteer experiences, and professional licenses or certifications in your resume. Edit your resume to reduce fluff and make every word count. Set your resume aside for a few days and then come back to it again with “fresh eyes.” Misspelled words and grammatical mistakes are the proverbial kiss of death in a resume. Eliminate them. Place your education after your experience. Do this if you’ve been in the workforce for more than five years. If the degree you earned is the most relevant or impressive detail of your education section, highlight it. If the school you attended is the selling point, emphasize it. Use a two-page resume if appropriate. This includes inflating your accomplishments, level of responsibility, or skills. Don’t confuse your resume with your autobiography. While there are many pieces of information that your resume must have, its primary purpose is to focus on the aspects of your life and career that address the employer’s needs. You’ll have the rest of your application to highlight your life’s most important stories. Don’t use pronouns (“I”) or articles (“a” or “the”). They detract from the force of your accomplishments, slow down the reader, and take up precious space. Marital status, date of birth, height/weight, and similar non-work-related information can be used to illegally discriminate against applicants, and they rarely add anything of value to your qualifications. Don’t repeat the same action words throughout the resume. Instead of using the verb developed or led over and over, pull out your thesaurus and mix in terms like accelerated, delivered, directed, established, initiated, or reengineered. Even if you choose the functional resume format to minimize frequent job changes or lack of experience, include your dates of employment somewhere on your resume (usually at the end). Don’t use more detail than you need to convey your accomplishments. Dense, paragraph-sized bullet points make for tough reading. A good rule of thumb is to limit each bullet to one to two lines of text with three to five accomplishments for each position. Don’t use clichés like dynamic or self-starting. Let the details of your resume convince the adcom reader that you have these qualities. Don’t make your resume a list of your job duties. Instead, make it a list of your accomplishments! Weave your job responsibilities into your descriptions of your accomplishments. Do you need help putting together a stand-out resume? Or do you have a professional resume and need help transforming it into one suitable to send in with your application? Browse our Admissions Resume Services and work one-on-one with an expert advisor who will help you create a resume that will get you noticed by the adcom at your target graduate program. The post 18 Do’s And Don’ts For Your Application Resume appeared first on Accepted Admissions Blog.